September 14, 2017 – Orion’s three main orange and white parachutes descended through the skies over the U.S. Army Proving Ground in Yuma, Arizona, on Wednesday, September 13. 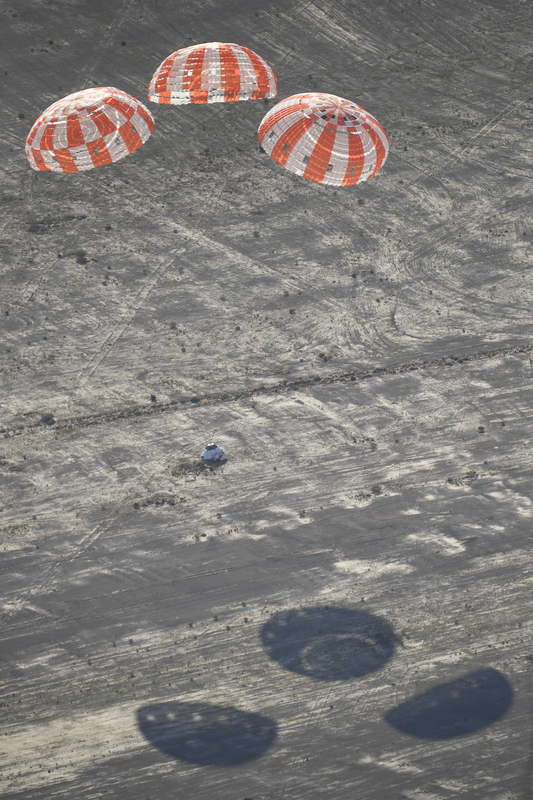 The parachutes carried a representative model of the Orion spacecraft in the latest of a series of eight tests designed to qualify Orion’s parachutes for missions with astronauts. During this test, engineers replicated a situation in which Orion must abort off the Space Launch System rocket and bypass part of its normal parachute deployment sequence. The capsule was dropped out of a C-17 aircraft at more than 4.7 miles in altitude and allowed to free fall for 20 seconds, longer than ever before. The fall produced high aerodynamic pressure before the capsule’s pilot and main parachutes were deployed, testing whether they could perform as expected under extreme loads. Orion’s full parachute system includes three forward bay cover parachutes and two drogue parachutes, along with three pilot parachutes that help pull out the spacecraft’s three mains. Beginning with the launch of the first integrated mission of SLS and Orion (Exploration Mission-1), this new deep space exploration system will support missions of increasing complexity over multiple decades.